Here is the transcript from Prophet Bob Jones from the Florida Revival and Healing Outpouring in Lakeland, Florida. with Todd Bentley at the Lakeland Florida revival, 5/13/08 evening service, via God TV. 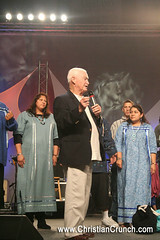 BOB JONES: “This is what the Lord would say to thee: Tell them of My way. What do I require of them this day, so that they may draw close to Me and stay that way continually? For I have come close to them this night. I brought the golden earring you see. And the awl was to pierce your ear to where you would ever be a love slave to Me. For I say those who are love slaves to Me will be the closest to Me you see. They will come and minister to Me. They will say unto Me how they love Me and how I am everything to them both night and day. Why is there no fresh bread in the House? This is a huge reason why the unsaved (shoot, the SAVED, too!) have no interest in the church. There is so little bread in the house. There was no bread in the house, so they left! They went on to Moab looking for something fresh. They found substance for a while, but quickly that was all taken. Naomi’s husband, as well as her two sons (Ruth and Orpah’s husbands), were killed. All of them were widows. Then, they heard something new…there was bread in the house again. They heard that the Lord had visited His people and had brought bread into the house again. You know what is funny about that? It is about the same time that Samuel had the first open vision in years. It was at this time (give or take 5-10 years) that Eli was passing the torch (or lamp, as in the Lamp of God), so to speak, to Samuel. Just a young boy, Samuel was recognized as one who was carrying the Word of the Lord. AND, it was at this time that “bread returned to the house,” that bread returned to Bethlehem. So, Naomi returned to her native land, and brought a friend! This is how it will be in the church again when we have been obedient enough, tender-hearted enough, to hear the voice of the Lord, and obey. Unlike Eli’s wicked sons who performed the sacrifices, the mantle was being passed to one who was obedient. And that obedience brought a fresh word, fresh mannah, fresh bread into the house. This is the place where the church is at. The Body has drifted away to other fertile lands. They are looking for fresh substance. We know that they may even find it for a time, but that many will be left alone in foreign lands. As ministers, we need to ensure that the Lamp of God does not go out (1st Samuel 3:3), we need to be sensitive enough to hear the Word of the Lord and bring “fresh bread into the house.” Only then will we see a return of our people from foreign soil. But, they will bring others who are unsaved. They will bring many who have never heard the Word of the Lord. And when they do, we will see an explosion in the church like never before!